Newspaper clippings note this as the fourth performance of this script. An Escape broadcast is in the count. he knows perfectly well where the missus is. Many of you follow the OTRR Facebook page and may remember that there were a bunch of reels offered that originated from the collection of a deceased OTR collector on the west coast. Many of these reels were donated to OTRR and I have been transferring the reel recordings where at least one show on the reel was Suspense. Most of the recordings from forty years ago are not as good as what we have today, but there have been some surprises in different versions; a handful of recordings have been superb and are upgrades. That is mainly what this next batch of programs are. I'm posting two today that are different versions -- they are not upgrades of what we have. One of the shows had an erased spot where I pasted in the missing segment. The sound difference is noticeable but it is brief, and I have noted the patch in the file name. These are probably missing East or West coast versions but we really have no idea which is which as I could not detect any clues from listening to the recordings. All of the better items in the reels will be released by OTRR at some point soon. These reels are a window into what OTR collecting was like in the 1970s. This was a very good and pretty well connected collector, but finding tape hiss and hum and other problems would be marked as "LQ" today, but at that time many of these programs were considered of VG or E quality. We don't have many more Suspense posts left to do. At some point next week there will be a brief break in the posts and then I'll finally get to Whistler and Johnny Dollar. Still have some organizing to do of those. As for Suspense, the recordings over these many months were from access to numerous collections close to the disc sources or from collectors whose collections were highly respected many years ago. I knew of many of them, some deceased, but whose recordings were shared with enough people that they survived through to this digital era. This is a much, much better time to be collecting OTR from a sound and technology perspective. Thanks Greybelt. Let me know if you need some help cleaning up the tapes. A quick note re: The Story of Ivy, a version of which was posted yesterday. 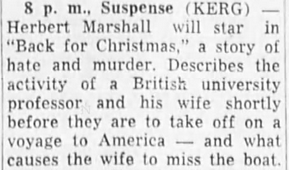 The May 3, 1945 Suspense episode is Fear Paints a Picture, but I found newspaper clippings with Turner cast for Story of Ivy for that very date, as well as Fear. There was obviously a change in plans. Ivy was done on June 21, 1945 with Ann Richards. Either Story of Ivy was not a good fit for Turner or it wasn't ready. Today's post stars Joe Kearns, first known to me as the next door neighbor Mr. Wilson on Dennis the Menace. Only by immersing myself into Suspense as I have done (and so happy so many have been along for the ride) have I realized how critical he was, week-to-week, in the Spier era of the program, announcing, as a supporting player, doubling or tripling supporting characters, and starring in it. His last Suspense appearance was in 1957. NOTE: I will be traveling the next few days and will not be posting. Part of my trip is pleasantly OTR-related, and I'll supply details upon my return. I will post again over the weekend. This was the original announced date for this offering. 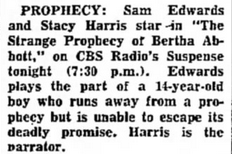 They broadcast Report on the X915 with Stacey Harris instead. The working title may have been different. and instead used a very generic item. This happened often, as I have learned in the newspaper searches I've been doing, because there still was significant publishing lag time without the electronic communications we often take for granted today. That lag time was the time it took for the network to mail the announcements and for the papers to receive them, and then get them into their editorial and production workflows. Some other special posts soon! This is a 64kps mp3; if anyone wants the FLAC or a 128kps mp3, send me a note. I am posting early as I have very short trip. Enjoy! This is an important moment for Suspense from a production and technology standpoint. First, it is the beginning of the William N. Robson era that will last until the show returns to New York. Just prior to Robson, show productions were bouncing around a bit, the last being Antony Ellis, one of the most gifted of radio’s practitioners. Robson did do some directing for Suspense, filling in on the hour-long “The Lodger” in February 1948 after Spier suddenly left the show in the mess around Robert Montgomery’s role as producer. Tony Leader would start the fixing process the following week, and stay on for the first Auto-Lite year. Robson wrote “The Treasure Chest of Don Jose” under the pseudonym “Christopher Anthony” as noted a few posts back, and also “Nobody Ever Quits” which would be performed additional times as “Night on Red Mountain.” Now, Suspense is Robson’s game until the end of August 1959. He contributed scripts for the New York series, and directed the 1960-02-14 Sorry, Wrong Number performance. That performance is curious because it has a Hollywood cast. It makes me wonder if it had already been recorded before the move to New York or if the episode storyline was done in Hollywood (since Agnes Moorehead was critical to the role) and the final production announcements and other editing were done in New York. This is worth investigating (at least to me it is), but it seems to be the case. There is a very good chance it is just the seventh broadcast in NY version wrappers. Perhaps someone can listen side-by-side (or as I learned from living in New England for many years, "side-by-each"!). The downside is that while recording tape offered great benefits to networks and production, it reduced the natural preservation of radio recordings. If a station wanted to record a disc of Suspense for later broadcast, the disc would likely be stored somewhere by someone. If it was taped, it was likely that the tape was erased and re-used. This is why the overall sound quality of recordings in Suspense are lower around this point of the series compared to prior years – we had to get lucky that there were people recording at home. There often was, and one of them may have been Pat Rispole [You must be registered and logged in to see this link.] of the Albany, New York area as well as collector John Furman. The AFRTS role in preserving Suspense was critical at this time, as it seems that no one knows where any of the original Suspense production tapes are or if they exist any more. So we rely on incidental recordings of actors, advertisers, stations, and especially fans for whatever exists in network recordings. 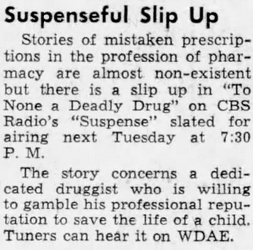 AFRTS was still sending out LP records of Suspense through the 1970s, so those are much better as an archive medium. 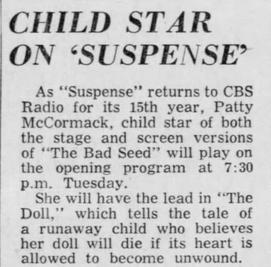 Also special about this recording is that Patty McCormack is likely the youngest actor to appear on Suspense. 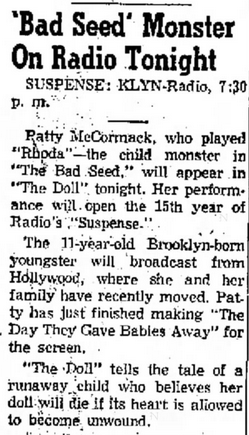 She was popular at the time because of her role in the movie “The Bad Seed.” This movie was a pioneer in the “evil kid” genre, which has been done much better since its release, but it was quite shocking at the time. Note that this episode has no close. I have never found a complete recording, and it is unlikely that one exists unless an AFRS version surfaces. Thanks greybelt for the episodes and all the extra information as well as all the interviews. I guess I would say it was a repeat if ALL of aspects of the broadcast were the same. But the the 1960s one has different announcing and other aspects standardized to the NY format. The other factor is that the press releases that CBS sent, as picked up by the newspapers, refer to this as the eighth performance and not the eighth broadcast, and strongly imply if not clearly state that this was a new performance. Liar liar pants on fire, those stinkin' PR people. changed to SWN in time for the original broadcast. Perhaps we can say that the PR folks did not let the facts get in the way of a good story. Martin's note in that blog comment about the time it was first on TV was obviously incorrect, and he is well aware of that now. We posted that here somewhere on the old thread that is still up. It starred Mildred Natwick and there are pictures online to show the set and the cameras. It got very negative reviews. At this very moment, I'm in the 7th performance in the NY wrapper frame of mind for 1960. In some ways, we shouldn't even count it as an eighth performance. How many performances did Moorehead really do? 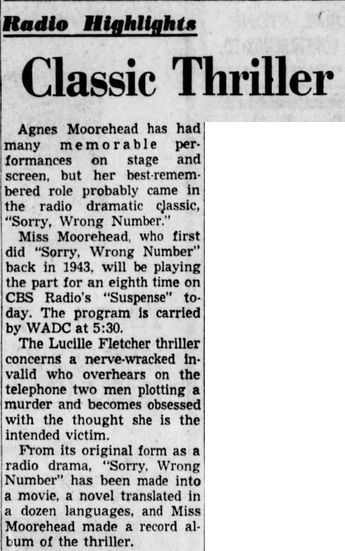 Discounting the 1960 broadcast because it did not require her to appear, it looks like Ms Moorehead went before the Suspense microphone ten different times, sometimes on the same day, to deliver this very exhausting performance. For the completists out there... she also performed for the Decca Records version, and for Philco Radio Hall of Fame. So add two... I don't know if PRHoF had separate E and W performances. I had some correspondence with Suspense researchers Keith Scott and Don Ramlow. Did you know that SWN had other working titles? According to Keith, Spier was the one who came up with "Sorry, Wrong Number" as he felt that Fletcher always had problems coming up with titles. We know the title announced the prior week was "She Overheard Death Speaking." Working titles from Fletcher started with "I'm So Nervous," which Spier changed to "If At First You Don't Succeed" and then "...Overheard..." and finally the best title of them all. play on air, likely delivered by air mail. Hawaii was not yet a state in 1957!